1. The LED starry silver color wire String Lights are made with a fine bendable soft wire that can conform to any shape to add a beautiful decorative accent. Flexible yet durable, the string lights are perfect for positioning lights to any decorative or holiday project. white LED's are individually mounted along the string and provide an elegant sparkling glow that can be seen from any angle. 2. The new version of this products come with Built-in memory chip 8 Mode Controller,Can recalls the last function set. 3. Connectable, with a tail plug, you can connect this string light to another one for using in a large space. 4. With a controller performs 8 different lighting function modes: Combination, In Waves, Sequential, Slo-Glo, Chasing/Flash, Slow Fade, Twinkle/Flash, Steady on. 5. Perfect for decorating your Garden, Christmas trees, parties, weddings and other celebrations. 6. This water drop flexible starry string lights are designed to be used both indoors and outdoors, the controller and plug is not waterproof, please cover them with waterproof material to keep the controller and plug away from water and rain. 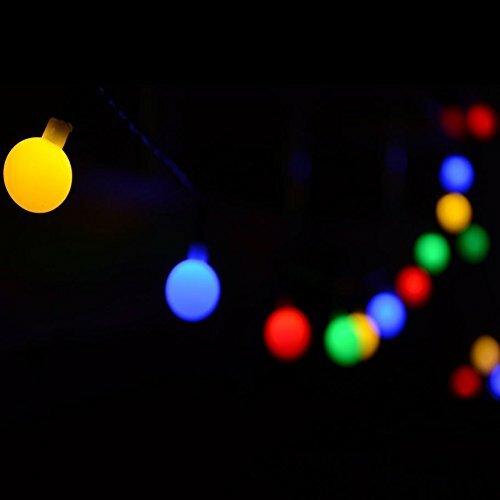 Super long 33 feet with 100 indivisual globe lights, super bright and perfect decoration for party, wedding, room, garden, home and Christmas. With it's own tail plug to extend it's length, support up to 164 feet. You only need to connect it's tail plug with the next one's plug. Depend on the area which you'd like to decorative. Advanced LED technology will keep 97% of the electric energy turns into luminous energy, and no heat energy consumption; No radiation and UV protection, safe and power saving. If you have any questions about this product by FULLBELL, contact us by completing and submitting the form below. If you are looking for a specif part number, please include it with your message.